Too Faced Chocolate Bon Bons Palette (16 x 0.03 oz.) retails for $49 USD ($59 CAD) and is said to be "an eye palette from the Chocolate Bar Eye Shadow Collection with 16 heart-shaped, cocoa powder-enriched eye shades in brights and neutrals." "This palette features matte and shimmer eye shades in cool pops of color, brights, and beautiful neutrals. 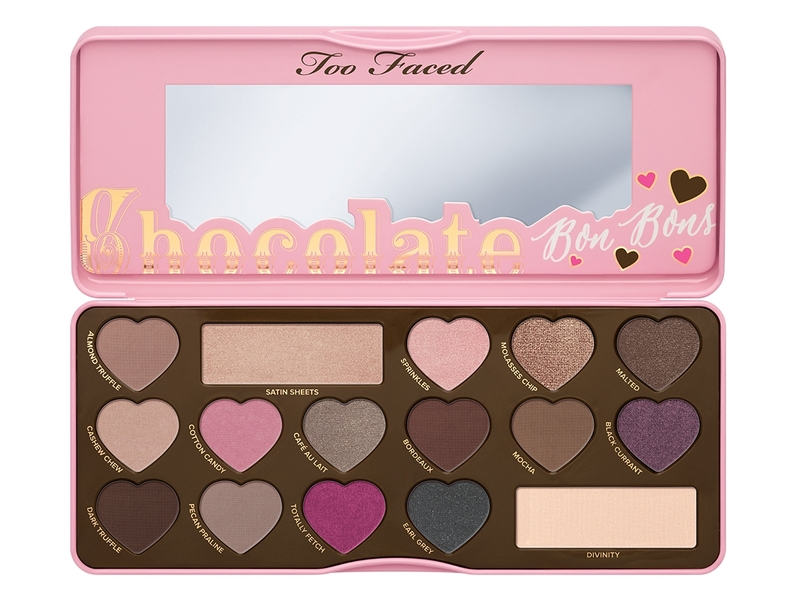 Each is infused with Too Faced’s chocolate-scented, antioxidant-rich, cocoa powder formula. The third palette in the bestselling Chocolate Bar Eye Shadow Collection, Chocolate Bon Bons includes a signature Glamour Guide with three beauty looks to get you started. With 16 shades, including two cult favorite hues, it’s perfect for limitless eye looks." 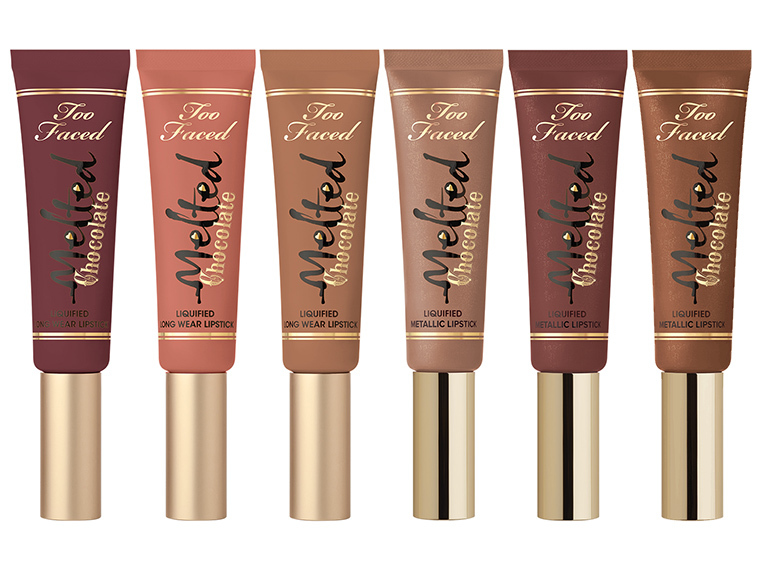 Too Faced Melted Chocolate Liquified Lipsticks (0.40 oz.) individually retail for $21 USD ($30 CAD) and is said to "pair with Chocolate Bar Eye Shadow Collection, Cocoa Powder Foundation, and Chocolate Soleil or Cocoa Contour for the ultimate chocolate experience!" "Our bestselling Melted and Melted Metal Liquified Lipsticks went through the candy factory for a delectable makeover in six new cocoa-powder-infused shades. Each mouth-watering tube comfortably coats lips in bursts of intense, high-impact, saturated color, while an innovative, angled velvet tip allows for precise application. Exclusive technology inspired by the molten form of lipstick during lab production keeps lipsticks melted for the most high impact color and rich shine possible." Too Faced Love Flush Blush Wardrobe retails for $36 USD ($52 CAD) and is said to be "for a perfectly customized look, apply a neutral shade to the temple along the hairline, then brush a brighter shade onto the apples of the cheek and blend." "Blush all day and night with the flush of true love! The long-wear, fade-proof, smudge-proof formula keeps your cheeks perfectly flushed for up to 16 hours. Six high-impact shades give a pretty pop of color for any skin tone—all in one adorable mirrored palette." Too Faced La Creme Color Drenched Lipsticks individually retail for $22 USD ($32 CAD) and are available in 10 new, permanent shades. 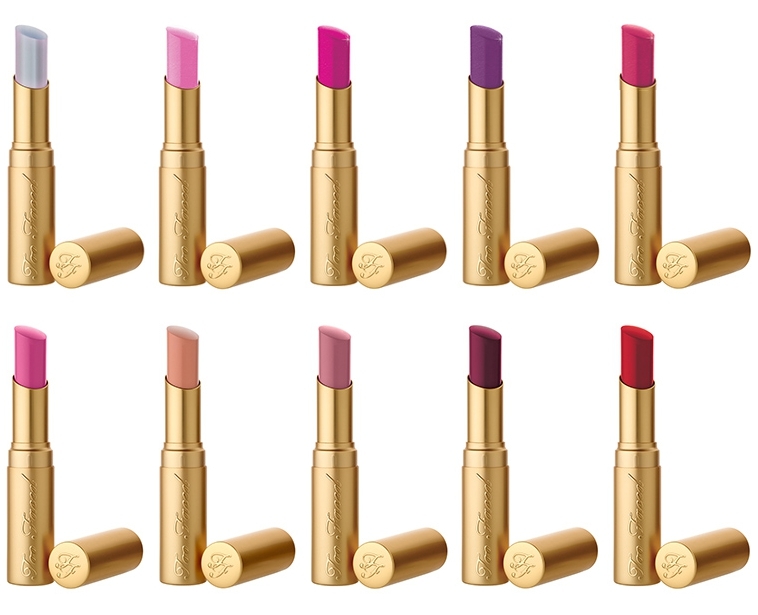 "There’s a reason why beauty editors, bloggers, and millions of social media fans are obsessed with La Crème Color Drenched Lipstick: it’s a completely unique, super-luxe combination of creamy color and intense hydration for unprecedented ultra-comfortable wear. La Crème Lipstick has seen a global increase from top-rated press and customer reviews, a halo effect of the success of Melted, and the overall increase in prestige lip category sales. To capitalize on this cult favorite, we’re giving the La Crème line a “re-love” with fresh positioning focusing on formula, new finishes, and one collection of on-trend shades." 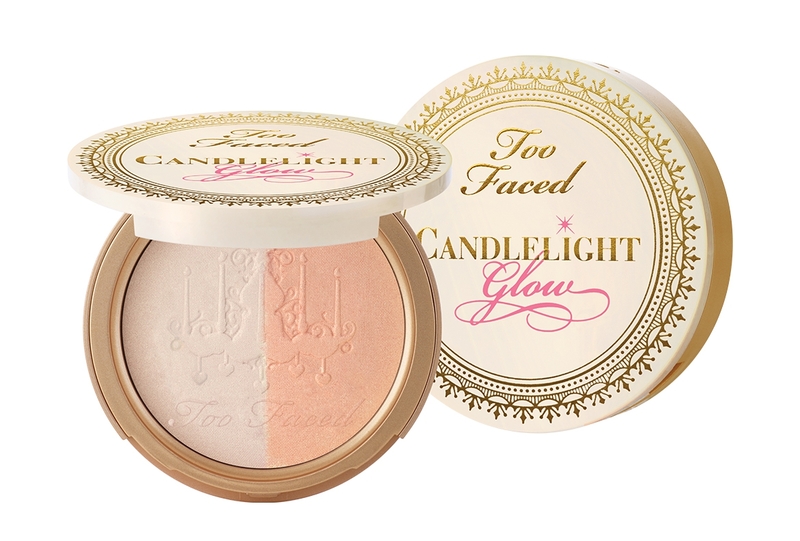 Too Faced Candlelight Glow Duo individually retails for $30 USD ($43 CAD) and is available in a new, permanent shade. "Never settle for bad lighting—create your own! We’ve revamped our bestselling highlighter by popular demand—and added a gorgeous new shade. Candlelight Glow amps up the wattage with PHOTOLITE technology, which diffuses and refracts light for glowing, lit-from-within skin under all lighting conditions. 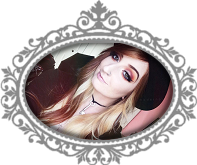 The sheer dual powders can be combined for a versatile, customized shade that looks gorgeous anywhere you apply, or use one at a time for the perfect soft-focus glow." Too Faced Mr. Right Perfect Powder Brush retails for $36 USD ($52 CAD) and is said to be "the gentle taper is perfect for sweeping along smaller crevices when setting under eye concealer or creating a precise contour." Disclaimer: All information provided by the brand(s), post may include affiliate link(s).